Next time you drive down Mt Baker Highway, I want you to try something. Take the time to notice and count the number of places you can buy fresh produce. I know, it’s hard to take your eyes off of the breathtaking views of the North Cascades and the glacial cap sitting atop Kulshan. But you won’t have to avert your eyes for long, and that’s the point of this exercise. You’ll only count a small handful of outlets on the 57 mile stretch of road. With the exception of these of oases, the majority of Eastern Whatcom County is what’s known as a food desert. If you live in Bellingham and have a number of grocery stores within walking or biking distance, it might be hard to fathom the need to drive 15 miles to find an onion, much less any kind of local produce. But for thousands of people, this is the reality. The Eastern part of the county is a stark example, but you don’t even need to go that far to experience this phenomenon. Even the Birchwood neighborhood is considered a food desert, lacking easy access to fresh vegetables and fruits. Food deserts are troubling for reasons ranging well beyond simple convenience. Access to adequate nutrition can be a predictor of other positive outcomes in life, and food deserts have the most negative impact on people who are already socially and economically disadvantaged. People without cars or who are budgeting every last dollar and minute of their lives to survival are the least likely to make a long journey for fresh produce, even though it’s in their best long-term interest. I paint this picture not to sow seeds of sadness (apologies if this is what’s happened, just hang in there, a positive story is coming!). The reason I describe the effects of food deserts is because I want to show how important it is to address this issue and support the people who are already doing so. Kelly and Michael of Pollen Folly Farm are an example of people working to provide nutritious local food to the people with least access to food. Located near Everson, the couple has been providing food to local food banks and other agencies that distribute food to low-income folks in nearby rural areas. 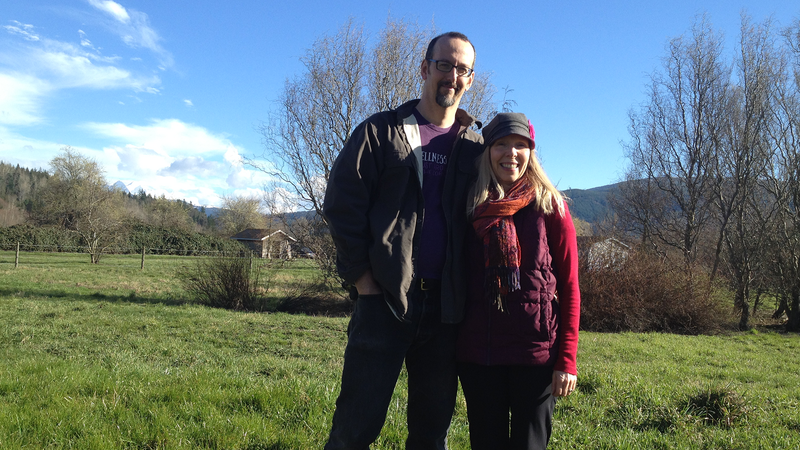 They started farming about five years ago after both attended school for sustainable agriculture. This background has given them the knowledge they need to grow highly nutritious food – exactly what people need to grow up healthy and better address other issues in their lives related to poverty. 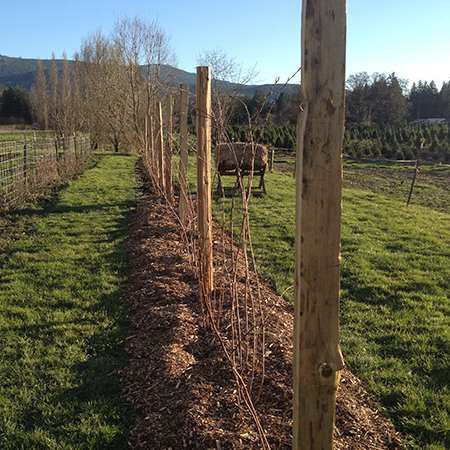 This background also allows them to maintain good soil tilth (tilth is to soil what health is to plants and animals). Better soils allow farmers to grow food with fewer amendments (like fertalizers and pesticides) – meaning fewer trucks moving the amendments themselves and less impact on water quality. Heathly soil also has a high organic matter content, meaning it stores more carbon dioxide from the atmosphere. So it’s not just good for the farmer and the customer, it’s good for the environment as well. But it’s not all a dull scientific pursuit. 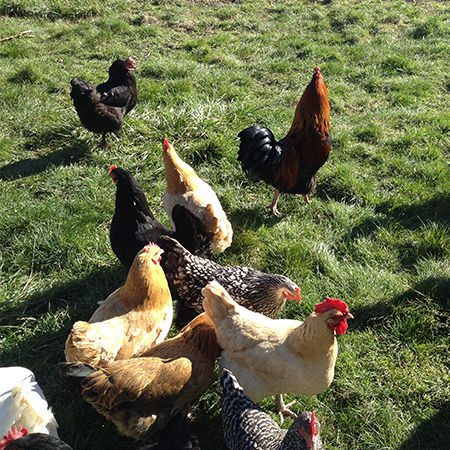 As we chat on their sunny deck, their chickens cluck and chase each other across the grass. They refer to it as “chicken TV” and choose it rather than having the electronic version. The view in the opposite direction is spectacular as well, the peaks of the Twin Sisters peeking over the foothills on an unseasonably warm and sunny March day. 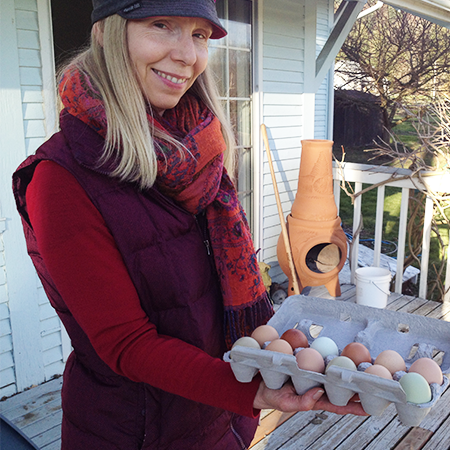 The chickens that provide entertainment also provide vibrantly colored chocolate and violet eggs, and good fertilizer. This fertilizer is then taken up by the crops to increase their nutrient content and keep the soil thriving. 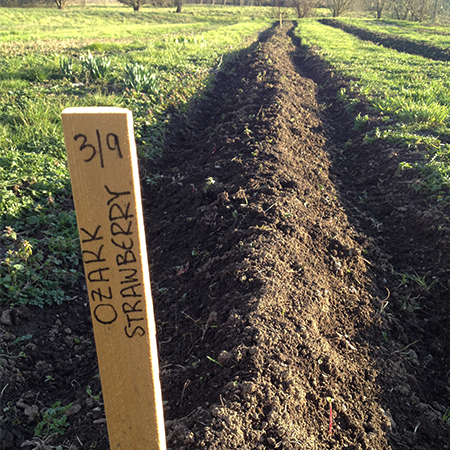 The crops are interesting as well – an heirloom variety of black sweet corn will share a field with Japanese cucumbers and newly planted strawberries and raspberries. What makes Pollen Folly Farm stand out is what might be referred to as intersectionality. Food systems are complex. It encompasses nearly every aspect of our society, from equality and equity to the environmental health, waste, and our water supply. More and more, farmers are trying to tackle these issues rather than simply producing food. Pollen Folly Farm is a great example of this effort, with a focus on producing high-quality food and being good stewards of the land and then making this food available to the people who need it most. And they’re not the only ones doing this. 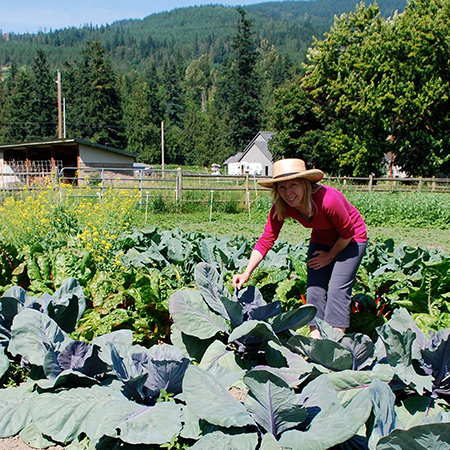 Twin Sisters Farmers Market, is a collection of like-minded farmers looking to feed the food desert that is East Whatcom County. You can find them at Nugent’s corner (where the ghost of the IGA still stands) or the North Fork library every Saturday starting in June. Pollen Folly will be participating this year, along with several other farms. 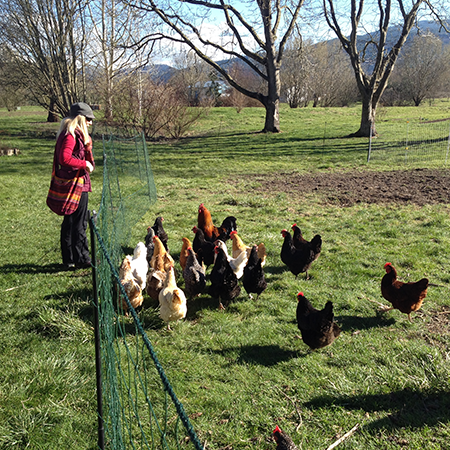 I leave the farm feeling a sense of hope for our food system. Although there are many challenges, we’ve got farmers up to the task. Caring for the land while providing good food for the community, these farmers are providing nutrition, opportunity, and happiness to their neighbors. Buying from them isn’t just an investment in your health. Buying from local, passionate farmers helps the people we love. It allows our friends, coworkers, and neighbors to be happier and healthier. It maintains the beauty that we are so privileged to have access to. It provides the safety of clean air and water for our families and children. Oh, also, it tastes really good. Taste for yourself by visiting the farm stand or signing up for their CSA! A CSA is an arrangement between a farmer and customer where you buy a subscription to a local farm in advance of the season. The farmer uses the up-front funds for everything needed to grow the food. In return, the farmer delivers your weekly “share” of the harvest. Participating in a CSA is the most powerful way we can support our local farmers and the time to sign up is now! You’ll get a variety of seasonal produce delivered June – October. They offer two size shares, one of which includes eggs! 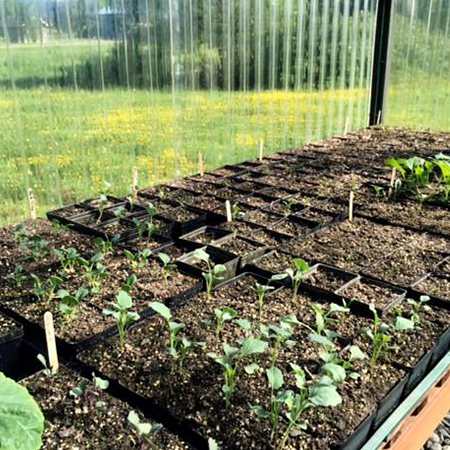 Click through here to find out more about how to sign up for their CSA!